NISA's Tips & Tricks: Touhou Genso Rondo Bullet Ballet (Part 5) | NIS America, Inc. Welcome to another addition of Touhou Genso Rondo: Bullet Ballet tips & tricks! 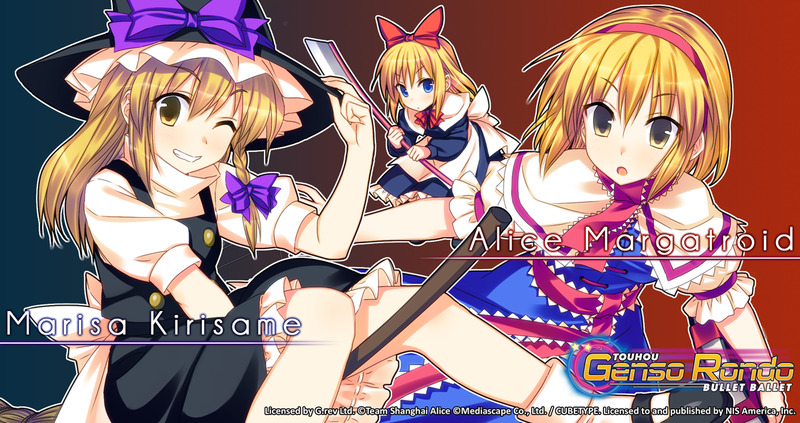 This week, we’ll be showing some gameplay of Marisa Kirisame & Alice Margatroid! Remember, there are many variations on how to play these characters, so don’t limit yourself on how you can defeat your opponent. Also, make sure to check out our previous tips (including mine!) & tricks for Touhou Genso Rondo, done by our lovely staffers Jordan, Chris, and Jupy! Starting off with Marisa Kirisame, let's take a look at what attacks you can use to your advantage against your opponent! Bio: A magician who lives in the Forest of Magic. She lives to make use of her magic in ways that aren’t helpful. She pokes her head in whenever something catches her interest. Her greatest characteristics are her speed, power, and also, her girly-designed, star-shaped danmaku. If you push X rapidly, a set of stars fling toward the direction you are looking at. This sub attack allows you to expel 7 sets of stars. Yes, this attack is incredibly slow. And yes, you can easily move away from this attack, but the purpose of this attack is to take up as much space as possible. If you utilize Marisa’s star arsenal, your opponent has less of an opportunity to dodge bullets and revitalize their charge bar. There’s actually two ways to use the square button. You can either rapidly push square, which emits green bullets, or you can hold square, which adds an additional purple/pinkish bullet to your main attack. Either way, her main attack is rapid…very rapid. I highly suggest using this attack AFTER you spread more bullets (i.e. Marisa’s X attack). Marisa wouldn’t be Marisa without her stars and this attack is no exception! Whenever I play against my co-workers, I always tend to come back to Marisa mainly because of this attack… It is friggin annoying… Trust me, I’ve gone against Marisa and this attack is easily accessible and doesn't even use any of your charge bar. USE THIS ATTACK AS MUCH AS POSSIBLE. Trust me. Bio: A magician who lives in the Forest of Magic. She uses magic to manipulate her puppets. Although she is an indoor type of person, she occasionally accepts requests to perform puppet shows for people. She makes full use of her puppets to control the area while she, herself, doesn’t move around. As her bio suggests, Alice isn’t the most agile character in this game, so she uses her magical powers to control puppets to do all of her dirty work. When you push X, you can use 7 of her puppets in one sub attack gauge to expel a puppet, which shoots out a red laser in one direction. You’re only able to cast 3 puppets at a time until the first puppet vanishes. This attack is fairly strong, but isn’t very effective if your opponent is quick. This attack is exactly like Alice’s sub attack (X), but on steroids. Alice fires 6 of her puppets to shoot lasers in different directions. Unfortunately, you can’t really control what direction each puppet shoots their laser, but if used correctly, you can trap your opponent between strong lasers. BUT REMEMBER! Any triangle attack depletes your charge bar, so use this attacking sparingly. I’m not gonna lie. This attack is hard to successfully land, but it’s soooooo gratifying if you can land it. When performing this attack, Alice throws an exploding puppet. Yep, an exploding puppet. Once it lands, there is a very slight delay before it explodes, hence the reason why it is hard to land. And there you have it! Again, these attacks were specifically chosen by me because they're the ones that I personally use. But there are other attacks that you can use against your opponents, so try ‘em all to fit your personal gameplay. Touhou Genso Rondo: Bullet Ballet is coming VERY SOON to North America on September 6th and to Europe on September 9th. Make sure to check GameStop, Amazon, and our very own NISA Online Store to preorder your copy today!